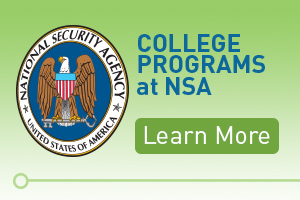 NSA offers a wide selection of paid programs for high school, college and graduate students in many career fields. College Programs at NSA. Download our interactive brochure. High School Programs at NSA. Download our interactive brochure. Take advantage of NSA’s student programs to learn more about NSA, deepen your knowledge of your career field, and collect a paycheck or scholarship money. We offer internships, scholarships, a co-op program and more. Search for the perfect opportunity for you based on your education level and field of interest. Remember, NSA selects most of its student program candidates up to a year in advance. That means your application will be due at least nine months before you start, so don't forget to plan ahead! As a corporate member of the consortium, NSA sponsors students pursuing doctorate degrees in mathematics, engineering, computer science, and physics. In addition to providing financial support, NSA also provides technical mentoring and at least one summer of employment to each sponsored student.